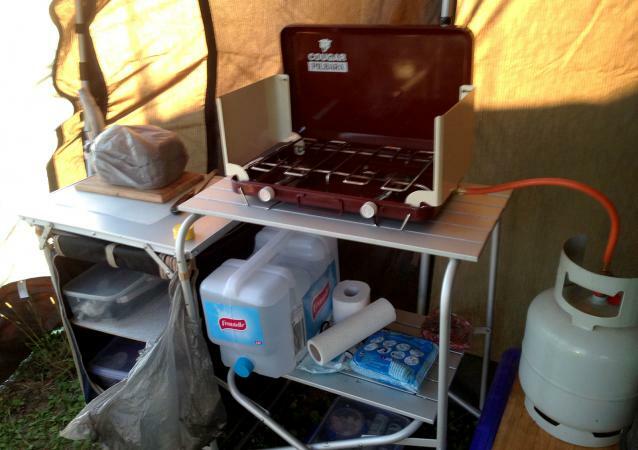 One way to manage the prospect of outdoor cooking is by using camping cookware organizers. These organizers allow you to transport, store and use your cookware in a way that keeps them clean and organized so that they are easy to find the next time you need them. Camping requires you to take care of the basic necessities of life such as sleeping, hygiene, drinking and eating. You may already have what you need for clean water and comfortable sleeping, but do you have all of the supplies that you'll need to keep everyone well fed? Camping cookware organizers can help you pack, transport and easily access your camping cookware when you're out in the wilderness. Packing all of your camping cookware into a satchel or backpack can feel like a very daunting task. Pans, cooking tools and utensils often have long handles or sharp points that not only make it very complicated to fit everything together in a small space, but you also run the risk of puncturing that bag or container. Special camping cookware organizer bags have storage straps, pouches and compartments designed specifically for safely holding plates, fragile glassware and sharp kitchen utensils. The Zelancio Deluxe Wicker Picnic Basket is a great example. Created for toting picnic supplies, it can also serve as a fantastic way to bring along your cookware in a convenient container that's easy to carry. Another example of how you can make the best use of your space is by using camping cookware organizers that double as devices with other uses. One such convenient piece of equipment is the Reliance Inflatable Camp Sink, which can be inflated manually or with an air pump. This versatile sink can also function as a wash basin or a floating cooler. Mess kits are not large containers that help you organize your cookware, but they are actually types of cookware you can buy that collapse down and fold into each large piece. These kits allow you to transport a large volume of cookware inside one object that takes up much less space than the entire cookware set does once it's reassembled at camp. These kits are an idea way to conserve space, especially if you're backpacking or otherwise need to reduce the overall volume of your gear during transport to the campsite.Some of these amazingly engineered mess kits allow you to pack utensils, bowls or plates and cooking pots all together inside a single mesh kit that's easy to carry. Most of these kits are usually made of material that's very lightweight so they can be included in your backpacking gear without adding very much to your overall carrying weight. One of the more useful types of cooking organizers are those that also hold your cooking and eating supplies while you're using them. These organizers make camping a lot easier. Instead of packing and unpacking all of your cooking supplies when you start camping and then again once you leave camp, these units let you pack your supplies once into the very container that you'll be storing them during your entire camping experience. This makes cooking at camp convenient, easy and even fun. A few examples of these organizers include the following. The Yodo Picnic Bag is a complete four-person picnic set that includes an entire table service for four people as well as accessories like a corkscrew and a cutting board. All of these supplies come in a high quality backpack with foil lining. Complete kitchen organizers convert from kitchen supply bags into a set of shelves that you can hang from a tree branch or a bar so that it doubles as a kitchen cupboard. Finally, in addition to storage bags that double as organizational units while you're camping, you can also bring camping devices that create an actual kitchen in the wilderness, complete with storage areas that make cooking enjoyable and fun. For example, the Gander Mountain Deluxe Camp Kitchen provides you with a perfect surface area for cooking on your stove, a sink underneath, and enclosed storage shelves. 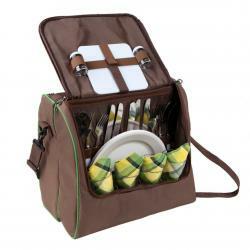 There is also a wide variety of hanging kitchen organizers that you can find at any outdoor sports or camping store. Need more helping figuring out how to handle your cooking needs while enjoying the great outdoors? Check out the following LoveToKnow Camping articles with valuable tips and techniques that can help you get - and stay -- on track.